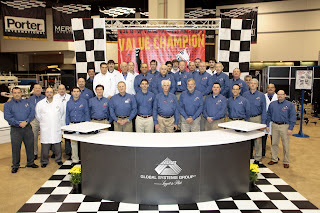 Global Systems Group had a crew from nearly every region of the world on hand to meet with our worldwide customer base at ISPA Expo 2010. Everyone was kept busy meeting with many old colleagues as well as introducing themselves to some new faces too. If you were unable to attend and would like updated on all the new equipment please contact your GSG representative as soon as you can. The staff of Global Systems Group looks forward to meeting with you at the next opportunity. If you think the crew looks good, you should see our machines! Thanks for the compliment.